Using Security Roles, you can granularly define which Exchange tasks you want to delegate to which users, and specify the scope on which they can perform the delegated tasks. For example, you can allow your Help Desk to only set out of office replies for the users who are members of a specific group. Permissions granted by Security Roles are effective only within Adaxes. In this tutorial, you will learn how to add permissions to perform various Exchange tasks to an existing Security Role. Expand Adaxes service \ Configuration \ Security Roles and select the Security Role you want to modify. In the Permissions section located to the right, click Add. Contact if you want to delegate permissions on mail-enabled contacts. Type Exch in the filter edit box to filter out permissions unrelated to Exchange. Check the permission you need in the Allow column. 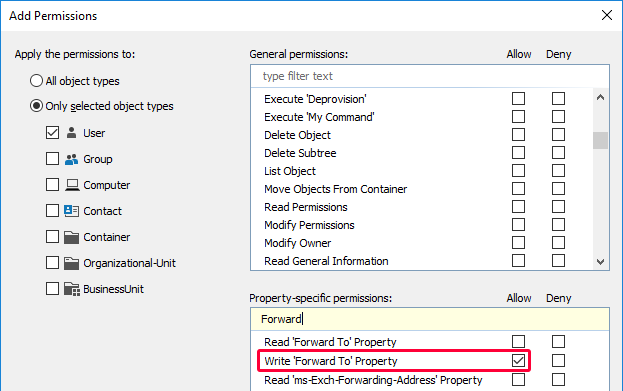 To grant the rights to modify all Exchange properties, select the Write All Properties (Exchange) permission in the Allow column. To grant the rights to modify a specific section of Exchange properties, select it in the Allow column. For example, to allow modification of the Automatic Replies (OOF) section, select Write Automatic Replies (Exchange). To grant the rights to modify specific Exchange properties, in the Property-specific permissions list, check the desired property in the Allow column.